Bloomberg's European HQ designed by Foster + Partners has been awarded the RIBA Stirling Prize 2018, the third time the practice has won the prize for the best building in the UK. The British international studio, founded in 1967 by Norman Foster, won the biggest prize in UK architecture for a £1 billion office, described as the largest stone building built in the City of London since St Paul's Cathedral. RIBA president Ben Derbyshire hailed the project as "a monumental achievement". "The creativity and tenacity of Foster + Partners and the patronage of Bloomberg have not just raised the bar for office design and city planning, but smashed the ceiling," said Derbyshire. "This building is a profound expression of confidence in British architecture – and perfectly illustrates why the UK is the profession's global capital. This role and reputation must be maintained, despite the political uncertainty of Brexit." Encompassing an entire block of central London, the Bloomberg HQ is formed of two blocks connected by a bridge. Great slabs of Derbyshire sandstone and fins of hand-patinated Japanese bronze form the grand facade of the ten-storey building, which claims to be the "world's most sustainable office". "From our first discussions to the final details of the project, Mike Bloomberg and I had a 'meeting of minds' on every aspect of the project – its sustainable focus, commitment to innovation and drive to create the best workplace for Bloomberg employees," said Norman Foster. "The RIBA Stirling Prize is a testament to the incredible collaborative spirit that has underpinned the entire project from start to finish." A pedestrian path runs through the site, re-opening the route of a once-forgotten Roman road. In the bowels of the great stone building the mystical Temple of Mithras has been returned to its former location, with a new interactive museum experience for visitors. The bottom part of a rippling mirrored artwork by Olafur Eliasson sits in the intersection of three curved timber shells above the main entrance to the headquarters. The top of the sculpture surfaces at the foot of a 210-metre-high bronze ramping stairway that spirals up to the top of the open plan office building. 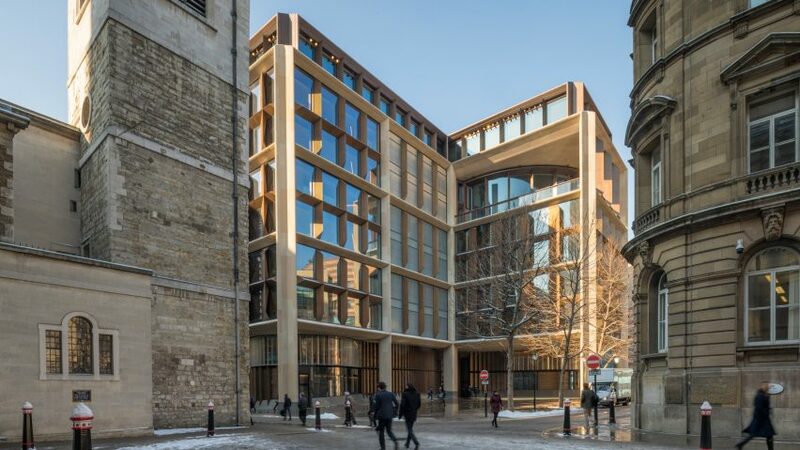 The Stirling Prize judging panel, chaired by David Adjaye, said the Foster + Partners-designed building was a "once-in-a-generation project" that "pushed the boundaries of research and innovation in architecture". "The design brief called for a building which could rise-up to the challenge of this loaded site and an information-driven environment. The architect worked exhaustively and collaboratively to design a building which perfectly responds to Bloomberg’s ambitions," continued the judges. "By building at a lower height than approved at planning, reserving parts of the site for public space, and using highly-detailed, handcrafted materials, Bloomberg shows a high level of generosity towards the City. This is a building of its place." The judges praised Foster + Partners rigorous design process, which included building 1:1 scale protoypes in a warehouse in Battersea and subjecting it to extreme temperatures and other stress tests, in order to improve the final building. "The real success though is in the experience for staff, visitors or passers-by – how Bloomberg has opened up new spaces to sit and breathe in the City; the visceral impact of the roof-top view across to St Paul’s from the concourse space, the energy of descending the helix ramp or settling into a desk in one of the dynamic new workspaces," added the judges. "This ground-breaking project demonstrates what is possible through close collaboration between highly-skilled, imaginative architects and a deadly sophisticated, civic-minded client. Bloomberg is an astounding commitment to quality architecture." The opening of the large offices for a global media company was regarded as something of a coup by London, with mayor Sadiq Kahn calling it a "vote of confidence" in the city. Michael Bloomberg, business magnate and former New York mayor, however suggested he might have thought otherwise about locating his European HQ in the UK, had he known it would vote to leave the EU. Each year the Stirling Prize is awarded to a building deemed to have made the most significant to British architecture in the past year. Five other projects shortlisted for the 2018 prize were Bushey Cemetery by Waugh Thistleton Architects, Chadwick Hall by Henley Halebrown, Tate St Ives by Jamie Fobert Architects with Evans & Shalev, Storey's Field Community Centre and Nursery by MUMA, and the Sultan Nazrin Shah Centre by Niall McLaughlin Architects. Foster + Partners has won twice before, once in 1998 for the Imperial War Museum in Duxford, and again for 30 St Mary Axe – also known as the Gherkin – in 2004. This year was the eighth time the practice had been shortlisted for the Stirling Prize. Last year the title of best new UK building went to the restoration of Hasting's Pier by dRMM.